This root canal was orginally done in 1982 and an instrument was separated at the time. Within the next two years, the tooth was treated with an apicoectomy to remove the separated instrument. This was "Old School" endo surgery. No microscope with an amalgam retrofill. Despite this, the tooth was retained (survived) for 25 years. 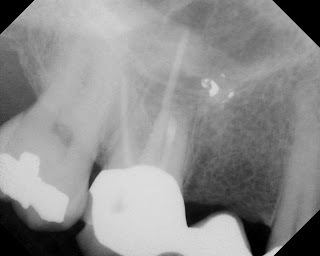 You can tell that the amalgam retrofill came loose and the apical seal was jeopardized. An apical radiolucency is apparent. 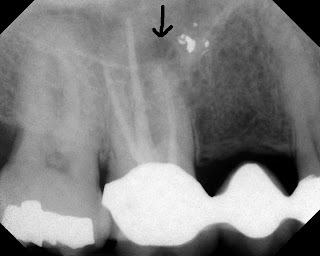 We discussed with the patient the possibility of a root fracture, but that the most likely reason for the apical lesion was the lost retrofill. 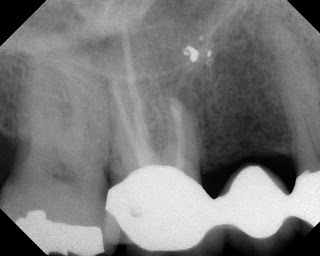 We recommended endodontic microsurgery to retreat the lost retrofill. The patient agreed and procedure was peformed. Under the microscope we were able to remove the fractured portion of the root. We went ahead and placed a retrofill with MTA (Mineral Trioxide Aggregate). Post-operative radiograph following placement of new apical retrofill. 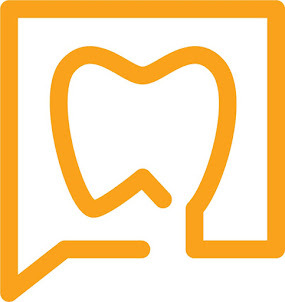 A six month recall on the tooth reveals complete healing of the bone and full function of the tooth. No pain to percussion, normal probings. 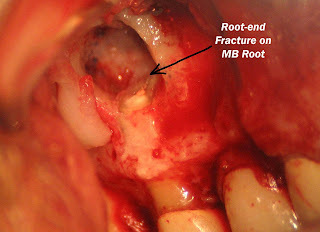 Despite a small root end fracture, this tooth was treatable with endodontic microsurgery. The endodontic microsurgery option has allow this patient to retain his natural tooth and keep his 3 unit bridge. Nice case. I am thinking board certification! Nice documentation. Have you ever stained with blue "To Dye For" stain. The contrast seems to help see things. I didn't even know this existed. Very cool case.